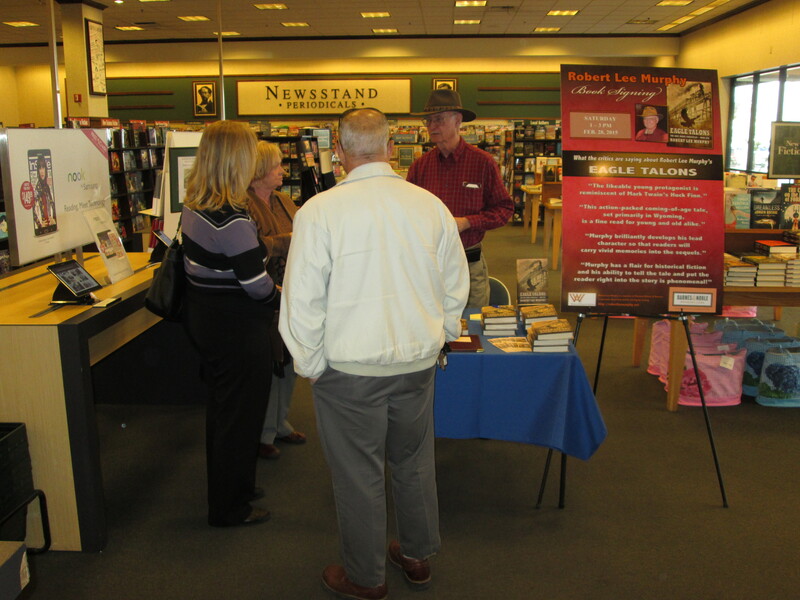 The Barnes & Noble book signing for Eagle Talons, The Iron Horse Chronicles–Book One, in Henderson, Nevada, on Saturday, February 28, 2015, was successful. I especially thank those of you who purchased the book and had me autograph it for you. I hope you enjoy reading the first book in the trilogy and that you will take time to send me your impressions by submitting a Comment using the form that appears at the bottom of this posting. You may also use the Contact form to send me an email by accessing it on the tab shown in the header above. Barnes & Noble was a busy place Saturday afternoon. It is encouraging to an author to see so many people buying books. It was obvious from observing the shoppers browsing the many aisles that there is a wide variety of genre interest. I was pleased to be able to discuss by writing with so many curious patrons, regardless of whether or not they bought my book. I extend my thanks and appreciation to the B&N staff for their help during this book signing event. 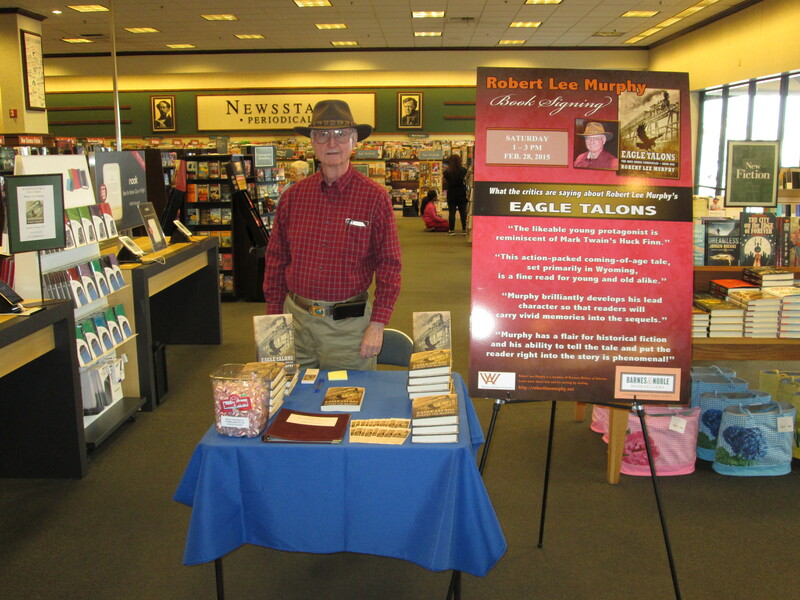 I was able to display a copy of the large print edition of Eagle Talons along with all of the hardcover books that B&N and I offered for sale. The large print edition is a high quality paperback published by Wheeler Publishing Large Print, an imprint of Gale Cengage Learning, which is also the parent corporation of Five Star Publishing. If your local Barnes & Noble store does not have the large print edition on its shelves, they can order a copy for you; or, you can obtain a copy online. A heads up! The final editing of Bear Claws, The Iron Horse Chronicles–Book Two, is complete. I have also received the artwork for the cover of Bear Claws. Future posts will feature the first three chapters of Bear Claws, which is scheduled for publication in November 2015. Will Braddock and his friends and enemies will continue the adventure of helping to build the first transcontinental railroad in Bear Claws. This entry was posted in Bear Claws - Book Two, Eagle Talons - Book One, Iron Horse Chronicles' Characters, The Iron Horse Chronicles, Transcontinental Railroad and tagged Adventure Fiction, Bear Claws, Eagle Talons, Fictional Character, First Transcontinental Railroad, Five Star Publishing, Frontier Fiction, Historical Fiction, Middle Grade Fiction, Pioneer Life, Teen Fiction, The Iron Horse Chronicles, Trains, Western Fiction, Westward Expansion (1867-1869), Wheeler Publishing Large Print, Will Braddock, Young Adult Fiction, Young Readers. Bookmark the permalink. Wonderful news, Robert! Many congrats on the success of your trilogy! This is Nora from the Anthem Authors. I wanted to say hello to you today and tell you how much we liked the picture that you put on your website but you left right after the meeting. I stayed for awhile after the meeting and one of the fellows read part of his novel. See you next week. Love to hear you read. (My pen name is Lindsey Barker).